"7.15 What a big demonstration! We need anti-nuke demos to protect the citizens' living! Slaying Noda [as in slaying a fictional monster] Demonstration Part 2 - Drus of Fury" just started. It looks like a nice, hot sunny day in Funabashi, Prime Minister Noda's constituency. People are of good cheer. Live netcast by IWJ's Chiba Channel 1. Unlike the protest at the Prime Minister's Official Residence in Tokyo, people here seem free to say anything. The head of the Japan Communist Party just spoke in front of a cheering crowd of ordinary citizens. One of the organizers is saying "Let's make the protest into 30,000-strong..." I think 300 hundred people or so all over Chiba, or Japan for that matter, is just fine. Japan is probably a great choice, because the country is about the only place in the world where both IMF and World Bank can hold their meetings in peace, without loud protests going on against them and their officials and the police battling the protesters. In fact, very idealistic (read "naive") people, both young and not so young, on Twitter are saying "Oh, maybe we can appeal to these world leaders about our bad government starting nuclear power plants against our wish!" Sorry boys and girls. IMF, or World Bank, is probably the last place you want to appeal for the nuclear-free world. As the Secretary General of the Japan Secretariat for the 2012 Annual Meetings of the International Monetary Fund and the World Bank Group, Ministry of Finance proudly recollects in the statement below, the last time Tokyo was selected to host the IMF/World Bank annual meeting was in 1964, the year Tokyo Olympics was held. A proud moment for the nation (at least the Olympics was). Secretary General Naka says Japan wants the repeat. His words eerily echo those bizarre, off-the-mark PR commercials made by the Ministry of Finance to appeal to the world how Japan has recovered from the earthquake of March 11, 2011 (no mention of tsunami or nuke accident). With growing uncertainty facing the global economy, cooperation and partnership among the countries has never been more important. The Annual Meetings of the International Monetary Fund and the World Bank Group, to be held in Tokyo in October 2012, will aim to promote global economic stability and to deliver a promising new start. Following the first Tokyo Annual Meetings in 1964, this will mark the second time that these meeting are held in Tokyo. Together with the Tokyo Olympics that were held in the same year, the 1964 Annual Meetings were an opportunity to promote Japan to the world and one of the driving forces behind Japan’s post-war new start. A half century has passed since. Japan presented itself as a candidate nation to host the 2012 Annual Meetings in hopes of once again achieving a new start. We want the people of the world to see a nation that is in the process of a strong recovery following the devastating earthquake. We want to demonstrate the underlying power of the Japanese economy through our unique advanced technologies and services, and by conducting a global event with perfect efficiency. At the Annual Meetings here in Japan, where the importance of partnership and solidarity is well understood and appreciated, we want to strengthen the bonds between the countries and forge the global resolve to sweep away the uncertainty surrounding the global economy. I think I like these organizers. 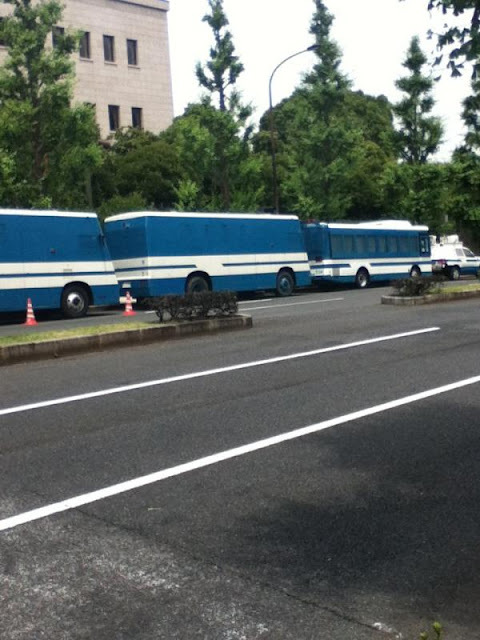 Clearly including the ones who organized the very fun protest on June 24 in Funabashi City, Chiba (Prime Minister Noda's constituency), the group of people calling themselves "Drums of Fury" is doing another protest in Funabashi. Participants are encouraged to take the "Yellow Train" - JR Sobu Line that goes from the western Tokyo into Chiba. This protest looks to be fun again, if I judge by their blog page. There are many who legitimately ask "How effective are these protests? They haven't achieved anything." I do share that sentiment, particularly when I see people falling for made-up symbols and slogans that have little to do with what's been happening in Japan since March 11, 2011. But on the other hand, it is still amazing to me, as a Japanese, to see Japanese people having been able to focus their attention to anything nuclear for the past 16 months. I've always thought (still think) the Japanese collectively have "attention deficit disorder". So, keeping doing something like protest marches all over Japan, no matter how small or large, may itself be worthwhile. After all, to express discontent to the authorities using drums, music, dance, ridicule, and marching on the streets and roads is a wonderful Japanese tradition for centuries. As the voices rise in various parts of Japan against nuclear power plants and against the restart of these plants including the protest at the PM Official Residence, Prime Minister Noda has reportedly commented on the protest voice to the police guarding the Residence, "It is a big sound." If the voice of protest is nothing but a "sound" to him, let's make our "voice" of anger into a really big sound and hit him so hard that he cannot ignore. That's the purpose of this demonstration. We are going to hit hard with our anger and our MC "Akuryo (Evil Spirit)" the constituency of Prime Minister Noda, Funabashi City, where there must have been many people who supported him and expected great things out of him. We look forward to having you there. The videos (four of them) were taken by the camera attached to the boom of the Putzmeister crane on July 5, 2012, during the air sampling operation. Very desolate feel to it. Supposedly, Kajima, one of the large general contractors working at the plant on construction and civil engineering, has been removing the debris using the remote-controlled heavy equipment. But it looks just the same as last year. For each of the 4 directions indicated in the handout above, TEPCO released 4 short videos. In mid June, NRC said the cause of the excessive wear of the tubes in the steam generators at San Onofre Nuclear Power Plant could be a faulty computer modeling by the manufacturer, Mitsubishi Heavy Industries, which underpredicted the velocity of the steam and water. Mitsubishi Heavy Industries sold 4 replacement steam generators to Southern California Edison. Each has over 10,000 tubes, instead of 4,000 or so for a standard steam generator that the company manufactures. Mitsubishi Heavy Industries is one of the top manufacturers of steam generators in the world. SAN ONOFRE, Calif. -- The wear in the walls of steam generator tubes that forced the shutdown of the San Onofre Nuclear Generating Station earlier this year was caused by a settling of support equipment and vibrations, Southern California Edison announced Friday. A leak from a tube forced the utility to take Unit 3 off-line in January, and thinning was found in a large number of them, which are less than two years old. The plant's other unit had already been closed for routine maintenance. Neither has been returned to service. SCE reported to the Nuclear Regulatory Commission last week that most of the wear in the tube wall was less than 20 percent, below the federal safety threshold of 35 percent. A tube over the limit must be plugged. The cause of the wear on the tubes was vibration, which is unusual, and settling of the support structures, which sometimes occurs, SCE spokeswoman Jennifer Manfre said. She said the number of tubes affected by the settling was higher than normal. "We're using this information and additional detailed data collected through testing to develop our repair plans according to best practices and industry standards, particularly the data on the unexpected tube-to-tube wear," said Pete Dietrich, senior vice president and chief nuclear officer. SCE reported that in Unit 3 -- where the leak occurred -- 1,806 tubes showed wear of some type and 807 tubes were ultimately plugged. Of those, 381 tubes were plugged for wear of more than 35 percent and the rest as a precaution. In Unit 2, 1,595 tubes showed wear of some type and 510 tubes were ultimately plugged. Six were for showing wear of more than 35 percent and the rest for preventative measures. The units each have thousands of steam generator tubes. An anti-nuclear group called Friends of the Earth released a statement Thursday, claiming that the utility and the NRC were down-playing the extent of damage. The FOE statement calls the steam generator problems at San Onofre the "most severe" of any nuclear plant in the United States. San Onofre has more than three and a half times the number of steam tubes plugged as a safety measure than at 31 other similar U.S. reactors combined, according to the group. They contend that the number of tubes plugged in Unit 2 -- which did not have a leak -- is nearly five times that of any other reactor. The San Onofre plant generates about 20 percent of the power for San Diego Gas and Electric. The utility is importing power to cover for the San Onofre shutdown, much of it coming over a transmission line from Imperial County that recently began operating. 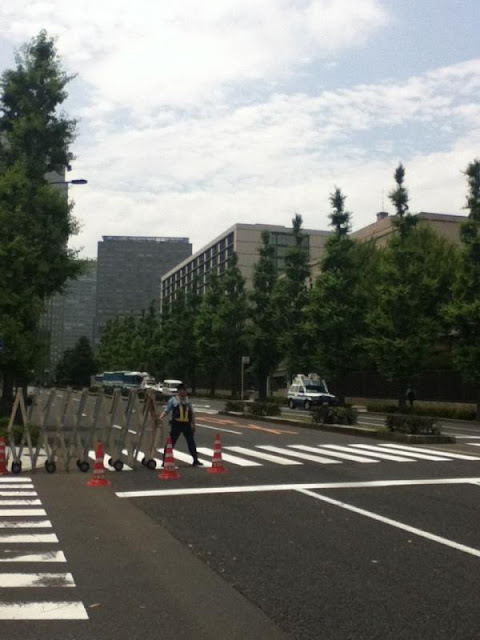 The Tokyo Metropolitan Police put up metal fences along the sidewalks, roadblocks, and restricted access to areas in the "protest zone" that they had set up, and effectively divided the protest into small pieces. No one seems to know how many people showed up. The supposed "police" number quoted by the press is 10,000 people, though the PR department of the Tokyo Metropolitan Police has said they don't announce the numbers. What "police" the mainstream media outlets have been quoting, no one knows; supposedly some anonymous inside source that the press club reporters have access to all the time. So, it was a success for the Noda administration and the pro-administration media, who didn't need to quote the number from the organizers this time. Tanaka calls it "Intifada". In Japan, it usually means the Palestinian ones. That's how he describes the protest that is herded in by the metal fences and the law enforcement. There are tweets from younger people saying they didn't like the "obnoxious and impolite" baby-boomer generation at the protest, who apparently complained loudly to the police and to the pushy cameramen from the media, as they should. Well, young people, tough. Reader Rick Streeby joined the protest in front of KEPCO's headquarters in Osaka City for the second time on Friday July 13, and posted the photographs he took of the protest on his blog. Though much smaller in scale and in publicity, people have been protesting there against the restart of Ooi Nuclear Power Plant operated by KEPCO and the number is increasing. I am surprised that the Osaka police, or the train operator under the advice from the police, mimicked the Tokyo Metropolitan police in closing the exit at the closest station. Rick reports, "They closed the station exit this time, so we couldn't get our message out to commuters, at least for a while." and this, as Rick says, ""No sales, leafleting, gatherings, placing of objects, loitering or other nuisance behavior --Kansai Electric Power." Yeah. "Nuisance behavior." Unlike the creation of nuclear waste without a plan for safely disposing of it." More photos at his blog, here. (UPDATE: IWJ's channels don't seem to be working. Go to Nico Nico Video. You can wait for IWJ's all 9 screens to go on air, here. Here's Channel 5. People holding white balloons must have gotten from Yasuo Tanaka, the head of New Party Nippon. You can also go to Nico Nico Video, netcasting the event for free for both members and non-members, here. 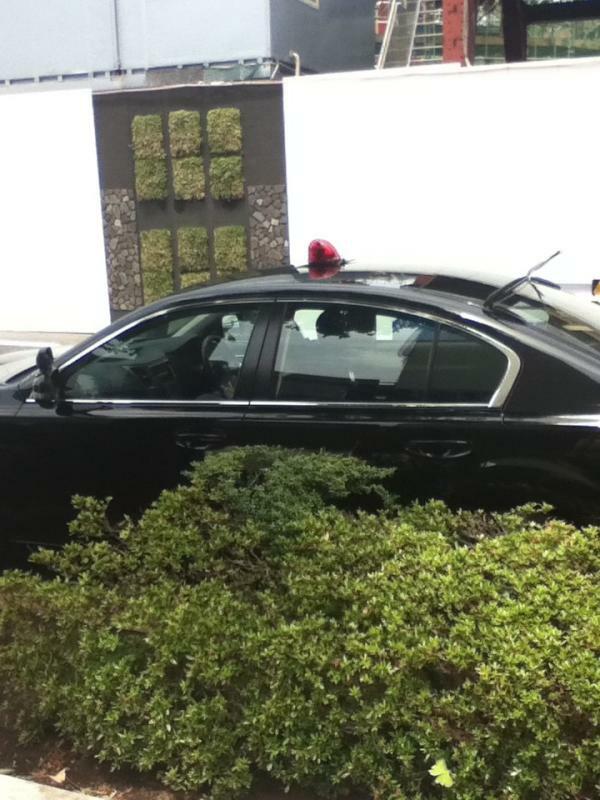 You see the policemen on the other side (road-side) of the metal fences they installed. If you go, be safe. If you want to watch USTREAM, Yasumi Iwakami's IWJ has 9 channels. See his page, here. For those of you who want to watch USTREAM live video, IWJ has 9 channels. Nico Nico Video has one channel you can view without subscription. See my latest post for channel links. 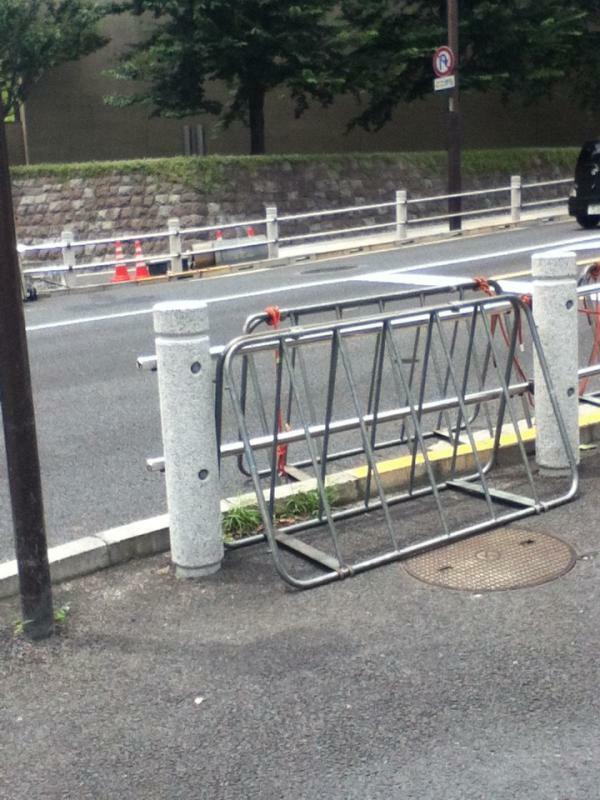 But people who plan to participate in the protest at the Prime Minister's Official Residence in Tokyo, watch out. The Metropolitan Police has announced that they will use (for the first time since the protest started in March this year) metal fences to prevent the protest walkers from spilling into the road and confine them to the sidewalks. Bad move. Some suspect the Police, under the direction of the Noda administration that seems to worship the US, wants to emulate the police in the United States. Bad move. Event: Lunch time protest walk "Hydrangea action"
There is one thing that has made me stop and think about the protest that's been on every Friday in Tokyo. It has swelled to 150,000 (according to organizers), and the organizers is pressing the participants to adhere to their guideline that this is a "single issue" protest. The single issue is to protest against the nuclear power plants, including the restart of Ooi Nuclear Power Plant. During the protest at Prime Minister's Official Residence, one woman made a speech. She was talking to the policemen in front of us, telling them and to us that young policemen from all over Japan have been sent to the areas contaminated with radiation without adequate protection against radiation exposure. I was listening to her, and thinking what a wonderful speech. Right after she was finished, the organizer said something like "Do not make speeches on irrelevant issues". I was taken aback a little. If the radiation contamination and effect of radiation exposure on people are "irrelevant" to the organizers, what is relevant to them? From the tweets of some of the members of the organizers (coalition of organizations), it is pure "anti nuclear" movement, without even considering what has happened as the result of the nuclear accident at Fukushima I Nuke Plant. Thus their tweets about excluding "Kinoshita-esque" elements and "Hayakawa-esque" elements from the protest movement, as both Mr. Kinoshita and Professor Hayakawa do worry about radiation contamination and radiation exposure effect on people. I wonder how the sheer majority of people who have joined the protest on Friday in Tokyo respond to the request by the organizers to focus only on "anti nuclear" and not speak about anything else. As the people so good at following orders and even outdoing what the orders require of them, I'm afraid they will simply follow the order this time, too. "Well I didn't know we shouldn't be talking about such a thing..." was the next tweet by the person whom I quoted above. The tethered robot also carried a recording equipment to record any sound of water in the Reactor 3 Torus Room, but the equipment was stand-alone. According to the handout, the survey was about three-quarters done. The workers and the robot spent about 3 hours on the work, when the cable communication to the robot was interrupted. 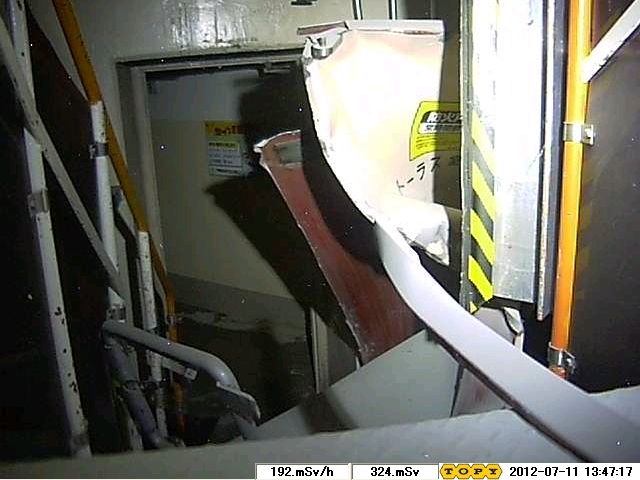 6 TEPCO employees who had been scheduled for 8 millisieverts radiation exposure for their work of carrying the robot through the narrow passage in the basement and holding the Torus Room door open actually got 5.32 millisieverts. In his blog post dated July 11, former Prime Minister Naoto Kan, of Democratic Party of Japan, commented on the Fukushima I Nuclear Power Plant accident by saying, "Almost all the causes for the accident had existed before March 11, 2011, the day the accident happened. And that's my conclusion." He denied his own responsibility, and criticized the response [to the accident] by TEPCO and the Nuclear and Industrial Safety Agency under the Ministry of Economy, Trade and Industry. It is a rebuttal to the Diet Investigation Commission's report that concluded the excessive interference by the Prime Minister's Office with the efforts at the plant was "the largest factor that prevented [TEPCO from] arresting the progress of the accident and minimizing the damage". Mr. Kan plans to write about his conclusions on his blog for a while. Mr. Kan sounds very familiar. Just blame the predecessors. It's the default position of the current president of the United States. On the second job since its debut in June surveying the Reactor 2 Torus Room, the robot Survey Runner became inoperable inside the Reactor 3 Torus Room. TEPCO says the radiation levels inside the Torus Room are just too high to retrieve the robot. The maximum radiation recorded by the robot before it became inoperable was 360 millisieverts/hour. The robot was tethered. TEPCO does not have the footage of the mission available. 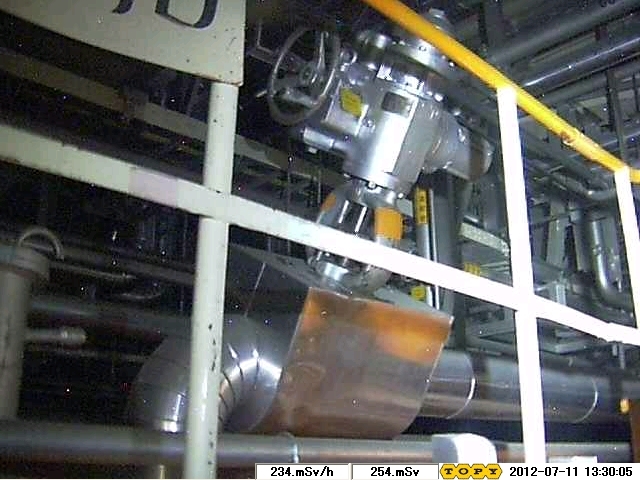 TEPCO announced on July 11 that the robot became inoperable after it was sent to the Reactor 3 building basement at FUkushima I Nuclear Power Plant to measure radiation levels and take the video. The company said it would be difficult to retrieve the robot for the moment because of the high radiation levels. According to TEPCO, the work using the robot was done from 11AM to 3PM on July 11. The workers operated the robot that went inside the Torus Room that houses the Suppression Chamber (which is part of the Containment Vessel) to survey. The highest radiation level recorded [inside the Torus Room] was 360 millisieverts/hour. The robot was tethered, but it became inoperable in the middle of the work. TEPCO said, "We don't know the cause yet, but it is possible that the cable got damaged." The robot was fitted with the recording equipment to record the sound of running water, but the equipment cannot be retrieved for the moment, either. Quince 1 is still stranded in the Reactor 2 building, "for the moment", in much lower radiation, relatively speaking (10 millisieverts/hour where it sits). I do hope TEPCO will release whatever footage they have, as well as the detailed information of what they did find. If anything, the new TEPCO under the control of the national government is releasing less information, not more. When they do release, they do so without detailed enough explanation on what they were doing. Case in point is the set of photos of the upper floors (operational floors) of Reactor 3 that the company released also on July 11. It is just photographs of the mangled upper floors, with no explanation when it was taken and how it was taken. I suppose everyone is expected to tune in to their press conference to find more (if there's more). From the looks of the photos, they seem to have been taken from the boom of the crane they use to take air samples above the reactors at Fukushima. 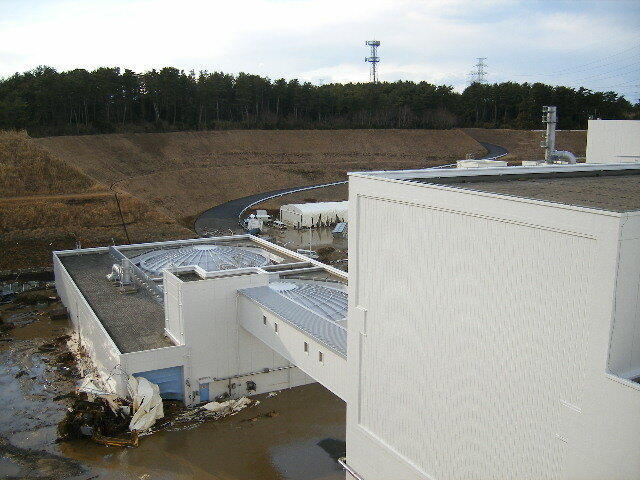 The air sampling at Reactor 3 was done on July 5, 2012, and the result of the nuclide analysis was released on July 10. It's been a long time since we heard anything about other nuclear power plants on the Pacific Ocean side of Japan. Tohoku Electric Power Company released the monthly report for Onagawa Nuclear Power Plant in Miyagi Prefecture for June 2012, and said a very minor damage was found in one of the channel boxes (that contains fuel bundles). It looks one of the top corners of the channel box in question had cracked and the portion had been chipped away (1.9 centimeter piece). It's not clear from the document whether these channel boxes were in the reactor when the earthquake hit and later removed to the Spent Fuel Pool, but Mainichi Shinbun (7/10/2012) says they were, and there are more than 10 of them damaged in a similar way. Tohoku Electric says there is no problem with the functionality of the channel boxes found with damages, and there is no leak of radioactive materials. There was a spike in radiation level at the monitoring posts at Onagawa Nuclear Power Plant in the early hours on March 13, 2011. The highest was 21 microsieverts/hour. At that time, Tohoku Electric announced that it was not from Onagawa Nuke Plant, which had achieved cold shutdown on all reactors. It was concluded that the spike was caused by a radioactive plume from Fukushima I Nuclear Power Plant. 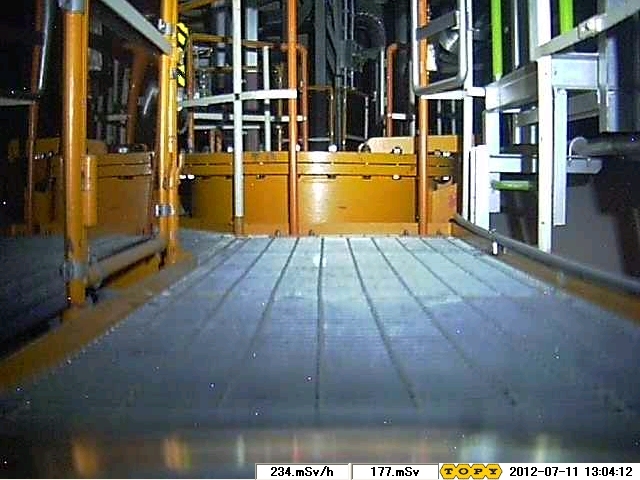 TEPCO is sending 11 TEPCO employees and one robot (Survey Runner, which looks like a smaller version of Quince and has already gone inside Reactor 2's Torus Room in April this year - photo, video) down to the basement of Reactor 3 to survey the inside of the Torus Room. Planned radiation exposure for the human workers is 8 millisieverts. No information of how long each worker will have to stay there to assist their robot co-worker. They won't go inside the Torus Room, as the very high radiation levels are expected inside. Instead, Survey Runner will go. The human workers will carry the robot through the narrow passage in the basement to the Torus Room door, which they will open for the robot. 8 millisieverts of radiation exposure. Before the Fukushima accident, it was rare even for the nuclear plant workers to get 1 millisievert exposure in one year. Now, the workers may get 8 years' worth of radiation in a day's work at Fukushima I Nuke Plant. When the workers tried to enter the Reactor 3 Torus Room in March this year, the access door was warped and didn't open. The workers didn't stick around to open the door, because the radiation levels were probably too high for the work (it was 75 millisieverts/hour in front of the door). TEPCO sent workers again in June to measure the water level in the basement. Purpose: As water leak investigation and water stop measure implementation are planned for the area from PCV / Reactor Building to the Turbine Building, it is critical to understand the current condition of the Torus Room. 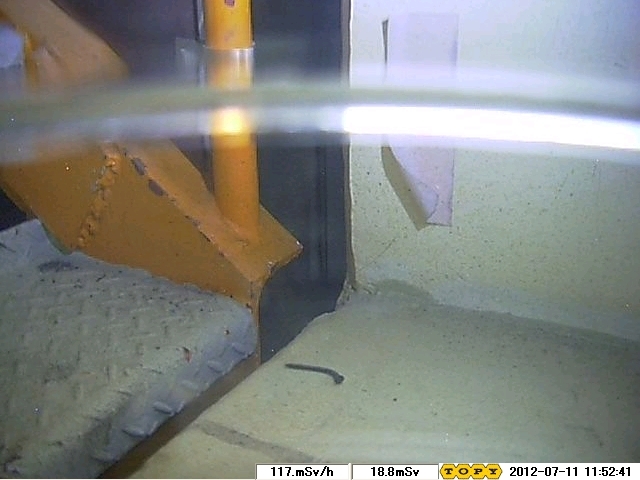 A robot will investigate the inside of Torus Room with high radiation dose to obtain inputs to be leveraged for planning the water leak investigation and water stop measures. The following will be done in the Torus Room in Unit 3 Reactor Building basement. The Commission seems to have concluded that Reactor 1 released large amounts of radiation on March 15 and 16, and again on March 21, 2011. It also suspects the fuel debris (corium) re-melt of Reactor 3 for the spike of radiation on March 21 and 22, 2011. In the latter, the Commission cites a research paper by Fumiya Tanabe published earlier this year but was reported in August last year. We referred to the outside monitoring data regarding the short-lived nuclides that are produced should the recriticality occur. At the CTBT Monitoring Post in Takasaki City in Gunma Prefecture, increased amounts of nuclides, including the short-lived nuclides, were sampled and observed around March 15 . However, we cannot deny the possibility that they were produced during the course of the regular reactor operation [as opposed to being produced by recriticality] or that they were decay products of such nuclides. According to the measurement by the Japan Chemical Analysis Center, the amount of tellurium-129, iodine-132, and xenon-133 showed rapid increase, but it is likely that they were originated in the normal reactor operation. From these monitoring data, we cannot find the data that clearly shows recriticality was taking place. However, it is apparent that there were large-scale releases of radioactive materials from Reactor 1 on March 15 and 16, and on March 21. The release of radioactive materials between March 15 and 17 is likely to have been caused by the damaged S/C (Suppression Chamber) and D/W (Dry Well) of Reactor 2, and by the Reactor 3 vent and the hydrogen explosion. As to the rise on March 21 and 22, we need to consider the possibility of the fuel debris re-melt in Reactor 3. Well, in other words, we still don't know what happened and how it happened after 16 months. The Diet Commission quotes the data and research papers, but all it can do is to suspect everything, and ends up listing all possible causes for the releases of radioactive materials. I read the tweets between the researchers (including Professor Hayano who tweeted this particular page). They are nowhere near any conclusion. The only thing that is notable for me is the mention of Reactor 1 as a large source of radioactive materials. Both TEPCO's and the government institutions' analyses indicate the release from Reactor 2 was an order of magnitude bigger than other reactors. I guess I will have to read the 646-page report to see if they have the data to back up their assertion about Reactor 1. If you think TEPCO was hiding something when the company first produced the document that was almost completely blacked out to the Diet Independent Investigation Commission back in September last year, wait till you see this map. It's a SPEEDI simulation map, done at the request from Shiga Prefecture to assess the risk of a severe accident at Ooi Nuclear Power Plant and shared with Fukui Prefecture, where Ooi Nuclear Power Plant is located. Shiga Prefecture is downwind from Ooi Nuclear Power Plant. Green Peace Japan requested the map from Fukui Prefecture under the freedom of information request, and this is what the Fukui prefectural government gave to Green Peace on May 9, 2012. The map is blacked out except for Shiga Prefecture, the prefecture who originally requested the SPEEDI simulation, even though Green Peace's request was for the SPEEDI map that shows Fukui Prefecture, which is located to the west of Shiga. The map is supposed to show, in different colors, the dose equivalent at thyroid for Fukui Prefecture in case of a severe accident at Ooi Nuclear Power Plant that would release a huge amount of radioactive materials including iodine-131. This is the map that the Fukui prefectural government disclosed to the Fukui residents: a blacked-out map that doesn't even show Fukui Prefecture. It is the information that has to do with the disaster response measures to be undertaken by Shiga Prefecture and Fukui Prefecture, and there is a possibility that the proper execution of the measures may be hindered by making the information public. Since we haven't done the simulation of a "severe accident" that releases iodine-131 at 10^16 to 10^17 becquerels/hour, there is no information to disclose. In the fiscal 2011, Ministry of Education and Science gave Fukui Prefecture 24 SPEEDI simulation maps each for Ooi Nuclear Power Plant and Mihama Nuclear Power Plant. The amount of radioactive material release that Fukui Prefecture set for the SPEEDI simulation calculation was the same as before the Fukushima accident, about one-millionth of the amount of iodine-131 released per hour at Fukushima. So, the Noda administration lied through their collective teeth when Prime Minister Noda and top ministers said Ooi Nuclear Power Plant and KEPCO could easily deal with an accident similar to the Fukushima I Nuclear Power Plant accident. The Fukushima accident was a "severe accident", but they didn't even do the severe accident simulation for Ooi Nuclear Power Plant. How would they know that they could easily deal with a severe accident they didn't even plan for? PM Noda said again and again that he would be personally responsible for the safe operation of Ooi Nuclear Power Plant. Now, I can only take it to mean that he is responsible as long as the plant operates safely, but he is not responsible if the plant doesn't operate safely. But this map really takes the cake. Move on, nothing to see here, literally. Following the almost artistic tsunami photograph in the previous post, here's TEPCO releasing 33 additional photographs of the tsunami that hit Fukushima I Nuclear Power Plant on March 11, 2011. There are people (including the Diet Investigation Commission on the accident, who just released the report) think the earthquake may have caused the initial damage to the plant that led to the core melt of Reactor 1. It may have indeed. But that doesn't in any way diminish the destructive effect of the tsunami. After all, a tsunami is not a one-off high wave on the beach but a manifestation, so to speak, of the massive amount of ocean water behind it moving toward the land. According to Jiji Tsushin (7/9/2012), TEPCO originally released 11 photographs in May last year. 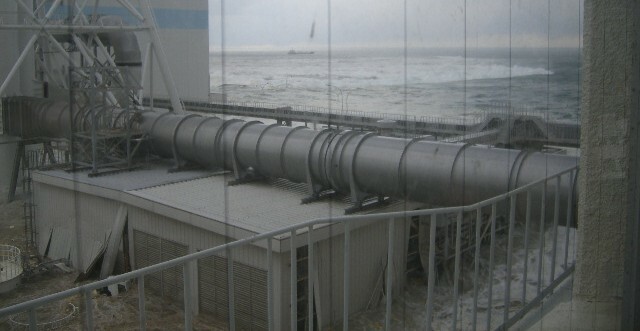 In September, NISA requested TEPCO to release all the photographs it took of the tsunami, but the company didn't. The final report by the Diet Independent Investigation Commission on the Fukushima accident pointed to the existence of these additional photographs, and finally TEPCO released them on July 9. 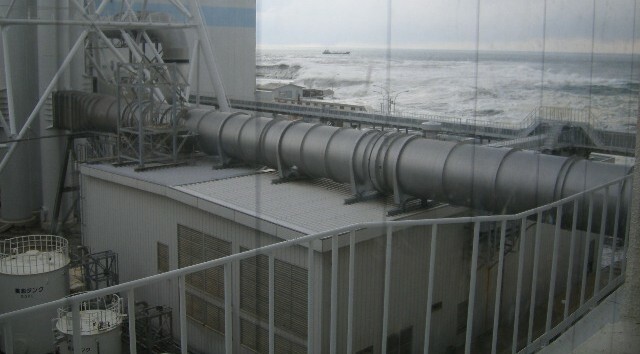 The photographs were taken by a worker at a TEPCO affiliate company from the building located to the south of Reactor 4. TEPCO's explanation was that the company thought the photographs were redundant. The worker who took these photos was apparently inside the building when the tsunami was approaching the plant, then moved to the rooftop of the building after it hit the facilities just outside the building where he was. In the first several photographs, you can see a small oil tanker hurrying out of the breakwater to avoid the on-coming tsunami. The earthquake hit at 2:46:18 PM on March 11, 2011, Japan Standard Time. The entire 33 photographs at the link. The most telling picture (to me) is the very last one, taken at 4:01:04 PM. It shows the terraced hillside, showing the original elevation of the plant location. If the plant had been built on that level, instead of digging down to the near-sea level, there might not have been the Fukushima I Nuclear Power Plant accident. The earthquake might have still caused damages, but the cooling of the reactors might have continued as the emergency power generators wouldn't have been swept away in the tsunami and the basement control panels wouldn't have been flooded.